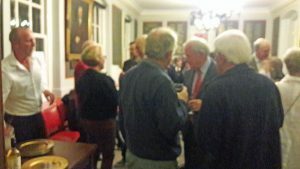 The Rye News team celebrated the paper’s fifth birthday last Friday along with some of our contributors, advertisers and friends, at the Town Hall. Although the first issue appeared almost five years ago, preparation and planning began exactly six years ago: capital had to be found, a website designed and tested and volunteer staff had to be recruited. 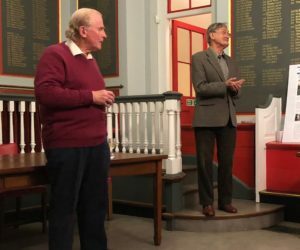 It is a tribute to all involved in the start-up that the paper is not only still running, but gaining readers each week and has rapidly become one of the institutions of Rye. In addressing the guests, Rye News founding director, Kenneth Bird expressed his thanks for the work done by all the founders and explained that the paper was based on the need for Rye to have a truly local news outlet and while a printed broadsheet had been the first option, cost would have proved prohibitive and so the on-line format was adopted. With more and more newspapers heading in the same direction and for the same reason, this proved a wise decision. It was then the turn of the editor, John Minter, to outline plans for the future. We have achieved a lot so far, but where to, from here? We are aiming, the editor explained, to put in place plans that would start the process of taking the paper through not just the next five years but give it a life for many further years to come. We need, he said, to expand the readership, especially within Rye itself. At the moment around 50% of our readers come from outside the town, which leaves us with two tasks: firstly to reach those in Rye who are not yet regular readers and secondly to ensure the paper continues to be as attractive as possible to those outside Rye and becomes the first point of information for anyone considering visiting the town or just wanting to hear more about our part of Sussex. A significant number of readers are London-based and others come from as far afield as Europe, the United States and even Australia and New Zealand. Increasing our readership by the initial target of at least fourfold would also make the paper more attractive to advertisers. In this respect, our lead designer of the new-look website, Dee Alsey is incorporating further pages which, amongst other things, will also contain a jobs page. With the number of seasonal jobs in and around Rye together with other industries recruiting or expanding, it is felt that this will be a useful resource to employers and job-seekers alike. One most important thing we have to consider when increasing our readership, John Minter said, is the age demographic of our readers. We need to attract far more of the young generation – the millennials would be a typical example – and to attract them as readers, we also need to attract them as contributors. The process of recruiting this younger age group was already under way. We are also, he continued, going to be increasing our visible presence around the town with event sponsoring and promoting as well as advertising. There are also opportunities to use other media outlets such as social media as well as other local and national news outlets, to spread us to a wider audience. He finished by saying that if the paper was going to support the town in the way we wanted to, it will also need the support of the town in the form of advertising or sponsorship to help us cover the not-inconsiderable costs of running even an on-line paper. So Rye News has completed its fifth year. Here’s to the next five and continued success for our hard working and dedicated volunteer staff. Image Credits: Kenneth Bird, Jess Angell, Dee Alsey. Congratulations on your five years, from one of your NZ readers (ex Rye and Rye Grammar School).